TECHNICOLD® Self-Contained Air Conditioning Units are custom built to the yacht owner's specifications. Combining the optimum installation space efficiency with the high standard 316L stainless steel construction incorporated in all TECHNICOLD® air conditioning units, these units are an excellent choice for the yacht owner desiring a quality package unit. TECHNICOLD® Self-Contained Air Conditioning Units are constructed as compactly as possible on a heavy gauge 316L stainless steel base. The 316L stainless steel base and hardware will ensure years of corrosion free service while maintaining the units original new appearance. 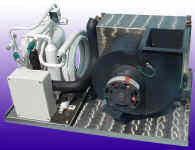 Tropical Marine Air Conditioning, Inc. services and sells marine equipment and Technicold marine A/C parts- Marine Air, AquaAir, Technicold, and Cruisair air conditioning, refrigeration by U-Line, Spot Zero and Sea Xchange, ECOmar Sewage Treatment Systems, and ice machines Eskimo Ice. CONTACT US for your marine parts and equipment needs.